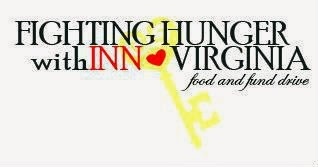 Foxfield Inn is pleased to announce that we are participating in this year’s fund drive to help restock our local food bank – Blue Ridge Food Bank. The Bed and Breakfast Association of Virginia has teamed up with the Federation of Virginia Food Banks to help raise funds needed to replenish local food banks that have been heavily used during the summer months. In our guest pantry area you will find a collection jar ready for your donation. Please feel free to give as much or as little as you want. Each $1 donation helps to provide 4 meals. In 2013 the Virginia food bank network distributed almost 137 million pounds of food and grocery products. This entry was posted in Uncategorized by Foxfield Inn. Bookmark the permalink.